One Indian community is growing like no other in the US. Between 2010 and 2017, the number of native Telugu speakers in the US surged 86%—the largest uptick in a foreign language-speaking group—the results of a September 2018 study by Center for Immigration Studies (CIS) show. This was the highest jump among the most widely spoken foreign languages in the country, among those that had over 400,000 people speaking it. Speakers of other popular Indian languages like Hindi and Gujarati also clocked high growth rates. Back in 2000, the US was home to just 87,543 Telugu speakers—the language is native to the southern Indian states of Andhra Pradesh and Telangana, which were a single entity until 2014. By 2010, there were 222,977. According to the latest figures, there are 415,414 of them, CIS found when looking at Census Bureau population data as of July 01, 2017. The news of Telugu’s increased adoption in the US is not surprising considering the massive representation of the south Indian diaspora in the tech and engineering spaces. Hyderabad, Telangana’s capital, sends the largest number of engineers to the US from India. Between 2008 and 2012, it sent over 26,000 students to the US, most of whom were pursuing degrees in science, technology, engineering, or mathematics (STEM) fields, a Brookings Institution report (pdf) revealed. Many immigrant success stories come from this part of India. For instance, both Microsoft CEO Satya Nadella and Adobe Systems CEO Shantanu Narayen, hail from Hyderabad. Starry-eyed youngsters from the region chase the American Dream so desperately that the state even houses a temple famed to help people secure work visas in the West. Even outside the nine-to-five software jobs, second-generation Telugu families are making a mark. Nina Davuluri, who became the first Indian-American to be crowned Miss America in 2013, has roots in Vijayawada, Andhra Pradesh. She is the daughter of Telugu-speaking doctors who migrated to the US in the 1980s. Telugu students have repeatedly won spelling bee competitions, including the top spot at the prestigious Scripps National Spelling Bee. There is a dark side to all this, too. A slew of Telugu workers in the US has been shot dead in various incidents, from hate crimes to robbery attempts. On the other hand, assimilation attempts are also prevalent. Community associations such as the California-based University of Silicon Andhra offer dance and music schools to impart traditional culture and arts. Even some mainstream college campuses are dedicating resources to explore the community’s heritage. In the face of the US becoming home for more and more Indian immigrants, Telugu is only one of the many languages from the country gaining popularity. Others, such as Bengali and Tamil speakers, have smaller populations of around 350,000 and 280,000 respectively, but they were still among the fastest-growing ones. The former logged a 57% increase while the latter, 55%. Telugu may have grown at a higher pace but Hindi remains the most widely spoken Indian language in the US. Though, at 863,000, it is dwarfed by the 41 million speakers of Spanish. 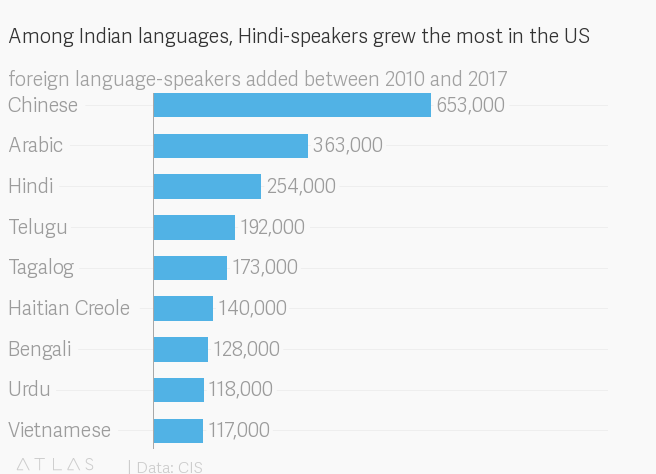 In absolute numbers, people speaking Hindi at home increased the third-most between 2010 and 2017, after Chinese and Arabic. 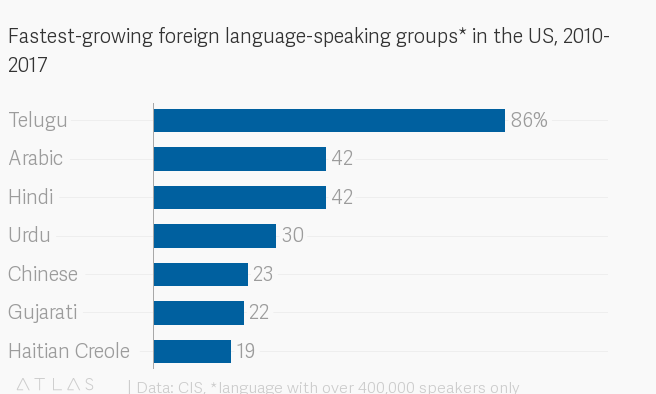 Overall, 21.8% of the US population speaks a foreign language at home, CIS said. In the country’s five largest cities, this share goes up steeply to nearly half of the residents. India, ironically, is home to about four times more English speakersthan the US.